Data lakes have emerged as an attractive complement to traditional data warehouses because they store masses of structured and unstructured data in native formats until analytical needs arise. However, many enterprises struggle to realize the expected return on data lake investments due to the unexpected challenges associated with data quality, data governance and data immediacy. This paper discusses how to automate your data lake pipeline to address these challenges and stop data lakes from devolving into useless data swamps. Attunity technology provides automated data lake pipelines that accelerate and streamline your data lake ingestion efforts, enabling IT to deliver more data, ready for agile analytics, to the business. Data lake origins and challenges including integrating diverse data from multiple data source platforms, including lakes on premises and in the cloud. Delivering real-time integration, with change data capture (CDC) technology that integrates live transactions with the data lake. Rethinking the data lake with multi-stage methodology, continuous data ingestion and merging processes that assemble a historical data store. 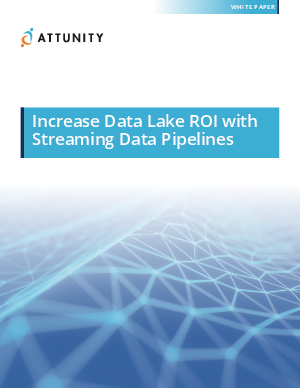 Leveraging a scalable and autonomous streaming data pipeline to deliver analytics-ready data sets for better business insights.